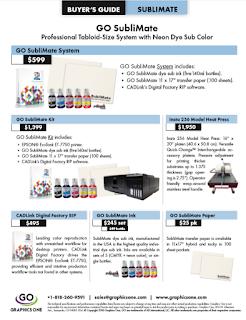 Recently Graphics One hosted Wasatch to profile GO's NeoTack Dye Sub Ink for use with Mutoh's 1638W Dye Sub Printer. The challenge with the new ink is to profile NeoTack CMYK (Super Black) with three neon colors--Neon Red, Neon Yellow and Neon Blue-with Orange without sacrificing speed or quality. Richard and Kerby successfully completed a number of ICC profiles of our Neon Dye Sub colors and also enhanced our Super Black dye sub ink results. The results have been astonishing. We are able to print at full speed 360x360--approximately 1000 sq feet per hour, without any banding. Additionally, the colors pop and offer a density not seen in the market previously. The configuration is using Wasatch SoftRIP with Mutoh's VJ 1638W Dye Sub printer imaging GO NeoTack dye sub ink in an eight color mode. The density of the colors and the lack of banding makes this one of the best combinations we have seen in the market. Graphics One will be showing this configuration during the ISA show next week in Las Vegas.